↑ Central Intelligence Agency (2016). "Paraguay". The World Factbook. Langley, Virginia: Central Intelligence Agency. अभिगमन तिथि 1 January 2017. ↑ Reed, Richard K. (1 May 1995). "Prophets of Agroforestry: Guaraní Communities and Commercial Gathering". University of Texas Press – वाया Google Books. ↑ अ आ इ ई उ "Paraguay". World Economic Outlook Database, April 2018. International Monetary Fund. 1 April 2018. अभिगमन तिथि 28 April 2018. 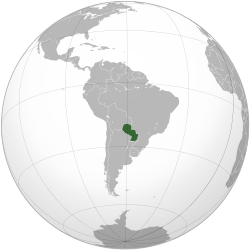 ↑ "Paraguay". The World Factbook. Central Intelligence Agency. 12 January 2017. अभिगमन तिथि 31 January 2017. ↑ Subsecretaria De Estado De Economia – ¿Qué Es Focem?. Economia.gov.py. Retrieved on 18 June 2016. ↑ "Paraguay - Ritual Kinship". countrystudies.us. अभिगमन तिथि 30 January 2018. ↑ "Duelling is legal in Paraguay as long as both parties are registered blood donors". happenedfacts.com. अभिगमन तिथि 6 अगस्त 2018.